The Green Book provided travelers with safe places to visit, eat and sleep across the United States. Did you know that Portland was included in this well-known guide book for African Americans travelling in the mid-twentieth century? The guide book was originated and published by New York City mailman Victor Hugo Green from 1936 to 1966, during the era of Jim Crow laws, when open and often legally prescribed discrimination against non-whites was widespread. Although pervasive racial discrimination and poverty limited car ownership, the emerging African-American middle class bought automobiles as soon as they could afford to do so, but when travelling faced a variety of dangers and inconveniences along the road, from refusal of food and lodging to arbitrary arrest. In response, Green wrote his guide to services and places relatively friendly to African-Americans, eventually expanding its coverage from the New York area to much of the United States. He also founding a travel agency. Union Station employed many black Portlanders who worked as Red Caps, food vendors, and matrons. At Union Station on St. John Street, the railroad was hub of employment for black Portlanders who worked as Red Caps, food vendors, and matrons. Many families lived on A & Valley Streets near their jobs at Union Station. Benjamin and Edie Thomas were one of these families. Benjamin was born in South Carolina and moved to Portland where in 1920 he lived at 368 Park Avenue and worked as a Red Cap at Union Station. The couple later lived at 28 A Street across from Union Station and operated ‘The Green Lantern’ a 16-room rooming house. Called the Thomas House Tourist Home, the bay window had a green lantern underneath lit, rain or shine, earning it its nickname. Edie and other members of the family operated the rooming house and kitchen. Edie had a contract with the government in WWII to feed African American soldiers. The café was known as the Green Lantern Grill and was on the first floor. Edie was the daughter of Mary Ann Cummings, who lived with the couple and helped out in the tourist house. The couple were listed in the Green Book as a safe place for a meal and rest. The couple later moved to 12 A Street. The Maine listing in the 1956 Green Book included the Thomas Tourist Home near Union Station. Portland’s Waterfront is a dynamic environment. It is under pressure from increased traffic and a lack of funding for needed infrastructure improvements. Fisherman worry about losing access to berth space and their ability to move product within the waterfront and to markets beyond the city. The conversation about the future of Portland’s waterfront is critical and of a concern to a number of stakeholders. Learn more about the waterfront, the ongoing work of the task force and be sure to make your voice heard! Maine Medical Center is proposing a new 2,400-car garage to be built off St. John Street. 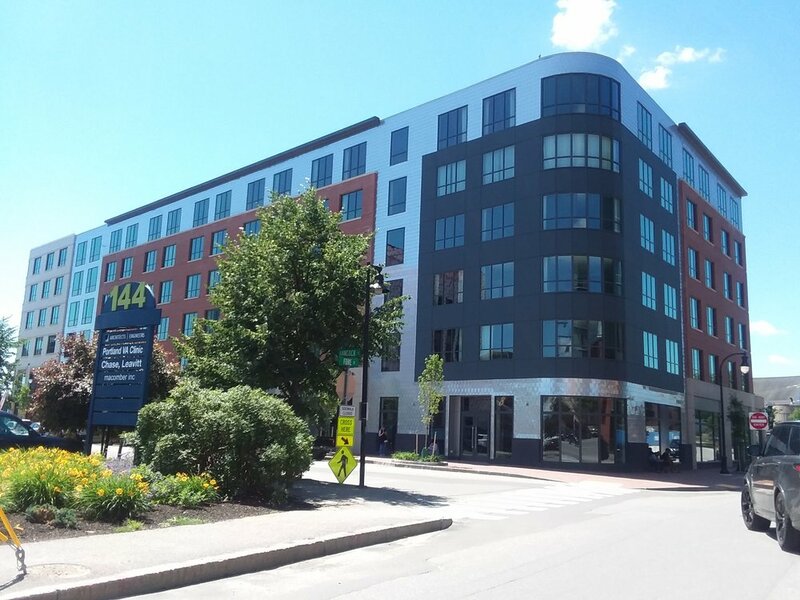 On Tuesday July 10th Portland's Planning Board will hold a workshop at 4:30 on the new 2,400 car parking garage proposed by Maine Medical Center off St. John Street. The new employee garage will be located behind the Maine Central Railroad Office Building, which is listed on the National Register of Historic Places and is a local landmark. The architect has created a number of images of the proposed building from various vantage points in the city. The new garage will be visible from I-295, St. John Street and the Western Promenade. For more information on the project, visit the city's website. Construction is everywhere in Portland! Which one will be a Future Landmark? An aerial image of the developing eastern waterfront prepared by Archetype Architects of Portland for a recent planning board submission to develop the Shipyard Brewery site on Newbury Street. The new WEX Headquarters on Thames Street is quickly taking shape. 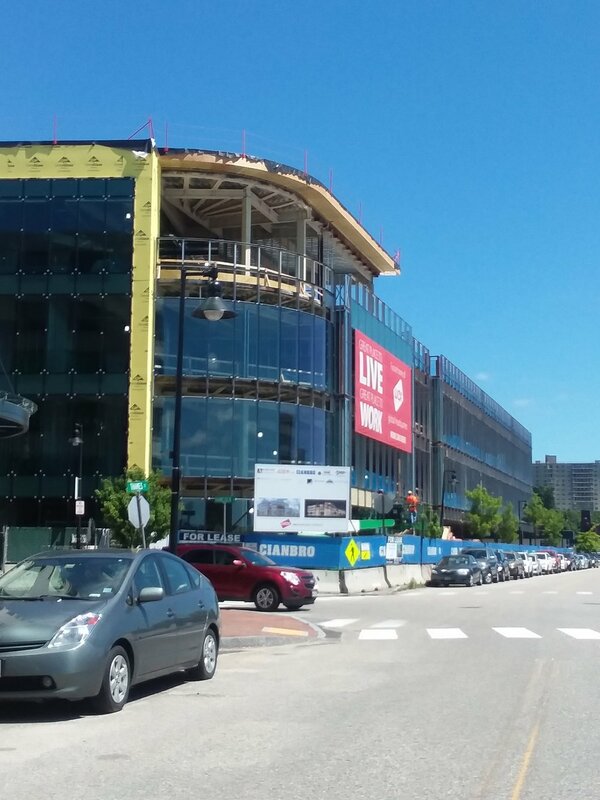 When finished the four story mixed use building will include 100,000 SF of office space for WEX, a local payment-processing service company. The first floor of the building will have some retail space and the roof will feature a rooftop garden and patio for the company's employees. The building's curtain wall construction takes advantage of the spectacular views from this waterfront site. Just down the street at 20 Thames Street a new residential and retail building is taking shape behind the former Grand Trunk Office Building. The building is part of a campus of new buildings that includes the new AC Hotel, a new office building on Fore Street, and a planned mixed-use building on India Street. 20 Thames Street will include 28 condo units. Scheduled to open this month is the 150-room AC Hotel by Marriot at the corner of Fore and Hancock Streets. The hotel has frontage on Fore, Hancock and Thames Street, with vehicular access for hotel guests off of Fore Street. The AC Hotel by Marriot at 158 Fore Street will be opening this month. The Mason Block, India Street is nearly complete. cPort Credit Union under construction on Middle Street. The new Mason Block is nearing construction at 62 India St. Three commercial spaces and parking are located below three levels of residential units. The project provides twenty-nine condominiums on the upper levels, nearly all of which are sold. the building is located in the new India Street Historic District. Next door to the Mason Block at the corner of India & Middle Street a four-story building is now under construction that will be the new downtown branch for cPort Credit Union. The credit union will occupy the first and second floors, while a 3,000 SF condominium will occupy the upper two floors and the rooftop terrace. This building, like the Mason Block is located in the India Street Historic District. A new office building is under construction on Widgery Way off Commercial Street. Further up Munjoy Hill, a new 45-unit condominium building has been proposed at 218-220 Washington Avenue. Meanwhile, smaller scale development on Munjoy Hill continues following the sunset of the demolition moratorium and City Council adoption of the new R6 zoning regulations in early June. Greater Portland Landmarks continues to work with neighbors and the city to protect some historic landmark properties on Munjoy Hill later this year. On the waterfont, a new office building is under construction near the head of Union and Widgery Wharves. It is the first project to be evaluated under new looser zoning regulations, enacted by the Portland City Council in 2010, that allow new buildings for non-marine uses within 75 feet of Commercial Street. The office building is one of three buildings proposed for the site. Just next door, a developer is pursuing a zoning change with plans for a hotel, parking garage, and restaurant on the site partially occupied by the Portland Lobster Company. 48 Brown Street - Site work for a new parking garage is getting underway at the corner of Brown Street and Cumberland Avenue. 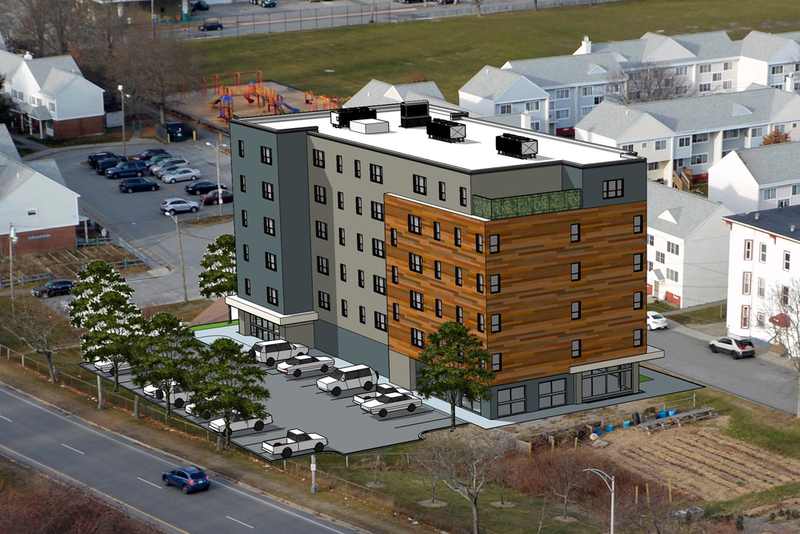 58 Boyd Street - Portland Housing Authority has plans for 55 new apartments in East Bayside. 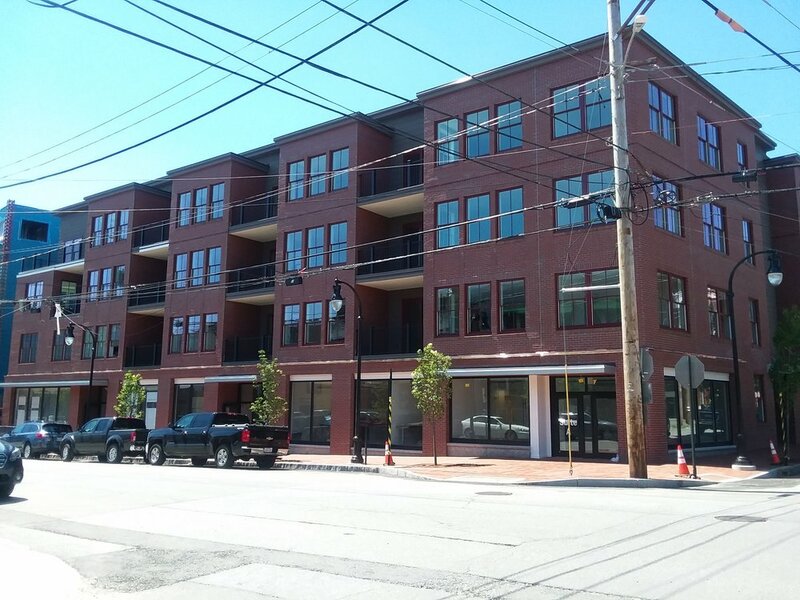 75 Chestnut Street - The land and approvals for this 54-unit apartment building, known as Westerlea View Lofts, in West Bayside is currently being marketed for sale. 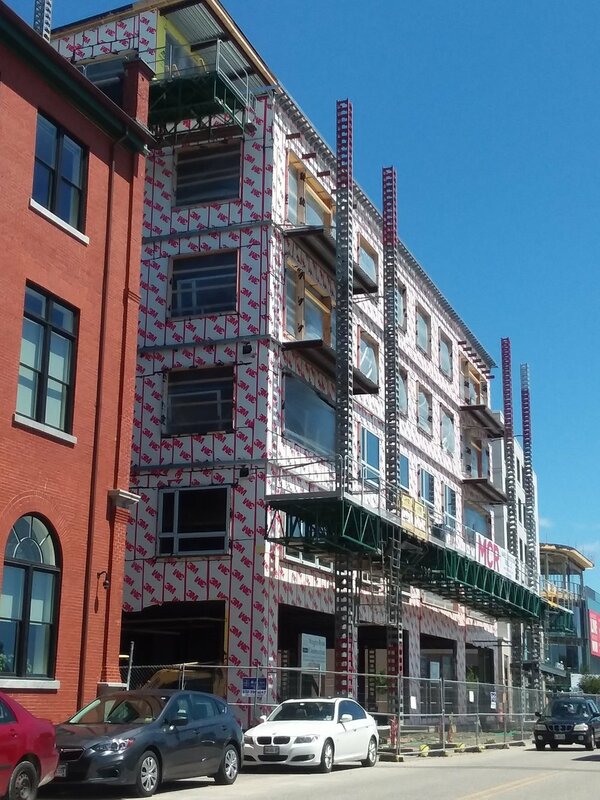 383 Commercial Street (the former Rufus Deering Site) - The first phase of this retail, residential & hotel development was approved in June. The first phase will include the hotel and half of the retail and residential units proposed for the former lumber yard site. The project includes a new pedestrian way connecting York Street and Commercial Street (image left). Deering Place is two new apartment buildings proposed by Avesta Housing on Deering, Cumberland and Mellen streets that will add affordable housing in the Parkside neighborhood. The Planning Board unanimously approved recommending passage of the revised zoning language for the R6 Zone on Munjoy Hill on Tuesday, May 15th. The City Council is expected to hold a public hearing and vote on the recommended changes on June 4th. The zoning recommendations reflect months of city and neighborhood conversations about the future of Munjoy Hill. Landmarks believes the package is a good balance between conserving what makes the neighborhood attractive, while allowing new compatible development to occur in this desirable neighborhood. City staff has recommended moving forward with historic district designations later this year and we are encouraging City Councilors to express their desire to see that process move forward as soon as possible, hopefully with public hearings this fall. Throughout the moratorium period, Landmarks has met with various stakeholders and the Munjoy Hill Neighborhood Organization (MHNO). In advance of the planning board public hearing we met with MHNO and the newly formed Munjoy Hill Conservation Collaborative. The three groups found we have major areas of agreement. to support the proposed dimensional standards with a couple of amendments for clarification purposes that would ensure the R-6 design standards will remain a useful tool for the planning board as they review the scale and massing compatibility of new construction on Munjoy Hill. Please contact the city council and let them know that you support Landmarks position and the position of our neighborhood allies. Thank you! On Tuesday, May 8th at 7:00 PM in City Council Chambers, the Portland Planning Board will hold a public hearing to consider a zoning map amendment and text amendments to the R-6 zone on Munjoy Hill. The purpose of the map and text amendments are to create an overlay district, the Munjoy Hill Neighborhood Conservation Overlay District, to implement new dimensional, design, and performance standards related to new construction and demolitions in the R-6 zone on Munjoy Hill. Included in the public hearing are text amendments, applicable city-wide, to divisions of the Zoning Ordinance relating to extensions of non-conforming buildings in Division 23 & Division 25. The full text of the proposed changes is available on the city website. remove language on non-conforming building extensions that would apply city-wide from the discussion of R-6 zoning on Munjoy Hill to allow time for substantive review and comment by the public in other areas of the city. Read more about Landmarks comments on the proposed changes. The Historic Preservation Office will be offering an informational session on Monday, May 7th at 6:30 PM in the Merrill Rehearsal Hall at 20 Myrtle Street. The meeting is intended for owners of property in Portland’s historic districts as well as anyone interested in learning more about the City’s historic preservation program. Whether you’ve recently purchased a property in a historic district, are thinking about undertaking a project, or are simply curious about the potential effect of designation on your neighborhood, this is your chance to learn more. City staff and members of the Historic Preservation Board will describe Portland’s historic preservation program, provide examples of typical reviews and answer your questions. On December 19 & 20, 2017, the House and Senate voted to pass the final version of the Tax Cuts and Jobs Act released by a joint House-Senate conference. It includes the 20% Historic Tax Credit. The House and Senate Conference Committee reconciled the differences between the two versions of the tax bill. They eliminated the pre-1936 10% non-historic tax credit and included the 20% Historic Tax Credit (HTC) with a provision that it will be claimed over five years. Also, the Conference Committee included additional transition rule language that now clearly covers phased rehabilitations for which the taxpayer may select a 60-month period. President Trump is expected to sign the bill before the end of the year. While advocates may be disappointed they could not fully restore the 20% HTC to current law and prevent the elimination of the 10% pre-1936 rehabilitation credit, there is plenty to celebrate! While hundreds of deductions and credits have been reduced or eliminated in tax reform, the HTC is expected to be retained as an incentive to protect and restore historic buildings in Maine and across the country. Fate of Federal Historic Tax Credits Remains Uncertain! Early on Saturday morning, the United States Senate passed its tax reform bill restoring the 20% Historic Tax Credit (HTC) with a provision that it will be claimed over five years. It can currently be claimed in a single year after a project is complete and the longer payout period is anticipated to reduce its value. The credit for pre-1936 10% non-historic “old-buildings” was eliminated. The House passed a tax reform bill on November 16th eliminating both the 10% pre-1936 non-historic “old building” credit and the 20% HTC. Tax reform legislation now moves to a House and Senate Conference Committee to reconcile the two versions. While advocates are disappointed the 20% HTC wasn’t fully restored to current law and the 10% pre-1936 rehabilitation credit was eliminated, we are standing our ground, insisting on the Senate provision and that no further erosion in the program take place. THIS WEEK please ask Rep. Poliquin to encourage the House Leadership to accept the improvements in the Senate bill! Thank Sen. Collins for supporting restoration of 20% HTC! If your live in the 2nd District, have friends in the 2nd District, or have a connection to Rep. Poliquin please contact him and ask that he work with House leadership to accept the Senate’s 20% HTC provision as they reconcile differences in the House and Senate versions of the bill. Please contact Sen. Collins to express your appreciation for the 20% HTC passed in the Senate tax bill. Please urge her to communicate to Senate Republican Leaders and Chairman Hatch that they must not weaken important protections for the 20% HTC when they reconcile the House and Senate bills. 2. Explain why you value Historic Tax Credits, and that the redevelopment of historic buildings will not get done without the HTC. 4. If your Member of Congress has agreed to help, please remember to thank them and tell others about their support! Recommendation to close South Portland's Mahoney Middle School and an update on the federal HTC program. Last week the Middle School Facilities Committee in South Portland voted to recommend closing Mahoney Middle School in favor of building a new consolidated middle school for grades 5-8 using state and local funds. Mahoney, formerly the South Portland High School when it was constructed 1923-1924, is located on a 15-acre site on Ocean Avenue in South Portland's Millcreek neighborhood. It is a significant historic building, both for its Beaux Arts architectural style and its community associations. If it is no longer used as a school, its future is unclear. The building has been determined by the Maine Historic Preservation Commission to be eligible for the National Register of Historic Places. It would be eligible for historic tax credits if it was rehabilitated for an income producing use. This week, as the Senate Finance Committee began to consider the tax reform bill, Senator Cassidy (R-LA) filed an amendment to restore the Historic Tax Credit from 10% to 20% of qualified rehabilitation expenditures. As a budget savings measure, the amendment changes the HTC to be earned in installments over five years. Preservation advocates are hopeful that this amendment will be included in the bill later this week either by the chairman or by committee vote. This is a significant improvement over the House bill that would repeal the HTC entirely. The final tax package will need to be negotiated by the House and Senate later this year. Please continue to voice your concerns with your Congressional representatives and encourage them to support the HTC, undiminished, in tax reform legislation. The Senate’s Tax Reform Bill Slashes the Historic Tax Credit Program in Half! At the end of last week, the Senate Finance Committee released their version of a tax reform bill that reduces the Historic Tax Credit in half, from 20% to 10% for historic buildings. Additionally, the 10% pre-1936 non-historic “old” building credit is eliminated. Also the House Ways and Means Committee passed The Tax Cuts and Jobs Act (TCJA) or H.R. 1, with the HTC entirely eliminated, on a party line vote 24-16, setting up full-House floor consideration early this week. Please call today and ask your House and Senate members to retain the HTC in tax reform bills, undiminished. The fate of the HTC will be determined over the next few weeks, please advocate and ask others to advocate! The House of Representatives is expected to consider and vote on the bill on the House floor this week. Also this week, the Senate will begin to mark-up and pass their version of the tax reform bill out of the Senate Finance Committee. Please contact Representatives Pingree and Poliquin today and ask them to work with House leadership to insert the HTC back into the final House bill. Please contact Senators Collins and King today and ask them to go to the Senate Finance Committee and Senate leadership, express support to retain the HTC in the Senate tax reform bill undiminished. Call during office hours. Ask to speak to tax staff or ask for the email address of tax staff. Don't live in Maine? You can still help! Contact representatives in your state and tell them historic tax credits are important! Don't know who to contact? Go here to find out. Help Save the Federal Historic Tax Credit! Clockwise from top left: Grand Trunk Office Building, Chestnut Street Church, St. Hyacinth School, Baxter Library Building, and Arbor Street Fire Station - all restored in part with help from the federal historic tax credit program. Right now Congress is close to finalizing tax reform legislation. The Republican leadership's outline for tax reform, meant to guide the legislative process, failed to retain the historic tax credit (HTC), despite its successful 35-plus-year history of revitalizing small towns, creating jobs, and increasing economic activity, all while returning more tax revenue to the Treasury than it costs. Without the federal tax HTC, our Maine State Tax Credit could also be at risk, and Maine's historic towns, cities, and Main Streets could lose an essential tool that helps drive economic growth. The HTC has helped revitalize historic buildings in Greater Portland and across Maine. In greater Portland HTCs have been used to revitalize waterfront storage buildings, former churches, abandoned schools, and former industrial buildings into restaurants, offices and housing, bringing activity to our neighborhoods and increased tax revenue to our community. Tax reform must not come at the expense of a program that more than pays for itself and has a proven track record of creating jobs, savings historic buildings, and bringing vitality to our communities. Please help us by calling or writing your lawmakers and urging them to keep the historic tax credit in any reform of the tax code! or call (207) 780-3575. Thank Senator Collins for being the lead co-sponsor of the Historic Tax Credit Improvement Act of 2017, which has been introduced in the Senate. Ask Senator Collins to continue her support for this program and urge members of the Senate Finance Committee to keep the Historic Tax Credit in the reformed tax code. or call (207) 883-1588. Ask Senator King to contact members of the Senate Finance Committee to voice his support for the Historic Tax Credit and ensure it is preserved in the reformed tax code. or call (207) 774-5019. Thank Rep. Pingree for being a sponsor in the House of the Historic Tax Credit Improvement Act of 2017. Ask Rep. Pingree to voice her support for the Historic Tax Credit and ensure it is preserved in the reformed tax code. or call (207) 942-0583. Thank Rep. Poliquin for being a sponsor in the House of the Historic Tax Credit Improvement Act of 2017 and for signing the off-committee letter to the House Ways and Means Committee from Republican legislators in favor of retaining the HTC in the tax reform bill. Ask Rep. Poliquin to continue his support for the Historic Tax Credit and ensure it is preserved in the reformed tax code. 2017 Places In Peril Announced! Top Row (Left to Right) Dunn Memorial Church, Mahoney School, Peaks Island Amusement District, and Portland Motor Sales Building. Bottom Row (Left to Right) 19th Century African American Historic Resources of Portland, Bowery Beach School, and Hay & Peabody's Seth Tomas Clock. Concerned that a number of historic properties in the Portland area are in danger of being irreparably altered or destroyed, Greater Portland Landmarks (Landmarks) recently announced its 4th list of Places in Peril, to call attention to the threats facing character-defining, historically-significant properties in greater Portland. This year, Landmarks has identified seven buildings or areas that are at critical points where they could be permanently lost or diminished. 3. Provide advice, convene people, and identify resources to preserve, protect and rehabilitate these properties. Significance: The Portland Motor Sales building is one of Portland’ most well-known Mid-Century Modern buildings, with its iconic folded roof as a character-defining feature of this style. It recently attained “historic” status as it is more than 50 years old. Threat: The property is vulnerable to redevelopment in an area of rapid regrowth, because this style is typically undervalued and there are no preservation protections for this building or neighborhood. Significance: The clock is a rare four-dial street clock that has a combination mechanical clockwork and electric motor. It is the only pole-mounted street clock built by the nationally renowned Seth Thomas Co. in the City. Threat: The clock is in serious disrepair due to a lack of maintenance over the decades. The specialized skills required to fix the clock and its original mechanism, and the associated cost have been barriers to its being restored to working order. 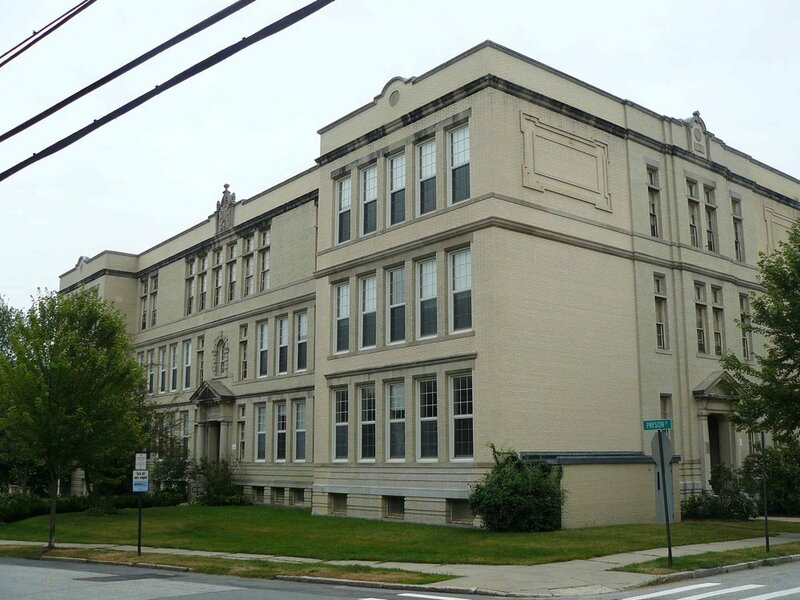 Significance: Eligible for the National Register of Historic Buildings, the Mahoney Middle School is located on a 15-acre lot at the corner of a major transportation route into parts of South Portland and Cape Elizabeth. It was designed by noted Maine architectural firm Miller & Mayo, and is a showcase for the Beaux Arts Style of architecture, preferred for important civic buildings. Threat: The South Portland School District has received state funding to renovate or replace Mahoney, or consolidate its two middle schools. Depending on the consultant recommendations, the future of the building is at risk. No preservation protections exist on the building to prevent demolition, or to ensure its rehabilitation and guide future additions or changes. Significance: Peaks Island in the late 19th century was famous for is summer entertainment and earned the nickname “Coney Island of Maine.” Greenwood Gardens was a portion of the Peaks Island shoreline transformed into an amusement park. Threat: Much of the Amusement District has not been formally documented and holds no preservation protections. As the demand grows for higher density and water frontage in the area, significant changes threaten this area’s integrity. Significance: The building is an architecturally significant structure and well-known visual landmark on Stevens Avenue, and was determined eligible for the National Register of Historic Places. It is one of the few buildings in Portland designed by noted Bangor architect Victor Hodgins. Threat: Improper use of mortar has led to decades of structural problems. The building faces extensive damage and an estimated $1.5 million to repair the bell tower. Concern for safety of passing pedestrians led the church to install a fence to keep people away from the stone tower. Significance: Few historic resources and buildings tell the story of the small but thriving community of African American citizens in 19th century Portland that contributed to its robust history. Three areas in particular, including Newbury Street, Lafayette Street, and the St. John-Valley Street neighborhood, contain buildings that historically represent this story. Threat: Land values are so high that these neighborhoods are experiencing intense redevelopment, including teardowns for new construction. Most have not been researched and are not within existing historic districts, with the exception of the Abyssinian Meetinghouse, a locally-designated landmark. Therefore, no historic protections exist for these buildings, many of which are modest in size and detail. Significance: One of the last remaining schoolhouses that characterizes the one-room schoolhouses in the Cape Elizabeth/Portland region. Unlike others, this building has been located on its original site since construction and contains most of its original features and architecture. Threat: A structural assessment shows the building’s framing needs repair from rot and rodent activity, and the current owner’s lack of funding threatens their ability to maintain the structure, putting it at risk. Landmarks will continue to monitor the endangered properties in hopes that they can be removed from the list in the near future. Landmarks’ intention is to proactively work with property owners as much as possible to protect the properties for the future. Construction is underway at the St. Joseph's Motherhouse! In December the Maine Supreme Judicial Court found the City Council had acted within their authority to rezone the parcel behind the Motherhouse to allow for higher density. In March the 1909 Convent and 1862 Academy buildings that comprise the Motherhouse were listed on the National Register of Historic Places. That same month the project received additional city funding support through the reallocation of federal funds from another project currently on hold. Quietly work has begun on demolition of the buildings' interiors. Crews have been carefully removing and labeling interior woodwork that will be reinstalled after new insulation and mechanical and electrical systems are installed. On June 22 a ground breaking ceremony was held to kick-off the project's rehabilitation. Representatives from the Maine Girls' Academy (formerly Catherine McAuley High School) and the City of Portland helped Developers Collaborative and Sea Coast Management celebrate the official start of the rehabilitation of this significant local landmark. Landmarks was delighted to help celebrate this first step in the building's new purpose. We congratulate all involved in helping to save these two historic buildings and provide affordable senior housing in Portland. Since 2012 Greater Portland Landmarks has highlighted buildings and sites throughout Greater Portland that are threatened by demolition, redevelopment, or neglect. This year's nominations for our Places in Peril program are due Friday, June 23rd. More information is available on how to nominate a property here. Prior Places in Peril nominees have included House Island, the Grand Trunk Railroad Office Building, Sacred Heart Church, Fort Gorges, and Lincoln Park in Portland as well as South Portland's Maine State Armory Building. The Armory Building and the Grand Trunk Railroad Office Building were successfully rehabilitated this year. The Armory now houses a convenience store, gas station and karate studio while the railroad building is now home to offices for Gorham Savings Bank. House Island was protected as a historic district by the City of Portland in 2015. Sacred Heart Church, an important cultural and religious center in the Parkside neighborhood, was able to surpass its fundraising goals to restore the church's copper roof and bell tower in 2016 after being named a Place in Peril in 2015. Work is ongoing at two current Places in Peril. Construction is underway in Lincoln Park to replace the crumbling sidewalks and restore the park's central fountain. Next year the city has budgeted for the perimeter fence to be restored. Out in the harbor, Fort Gorges will also be a construction site this summer as the Army Corps of Engineers undertakes some safety improvements. The city's consultant is currently preparing a historic preservation plan for the fort's structural stabilization and island improvements that should be released later this summer. Greater Portland Landmarks' Places in Peril program has successfully served as a catalyst for adaptive reuse and community revitalization. We continue to work to bring attention to other vulnerable sites on our list. If you know of a endangered property or site that should be featured by Landmarks, let us know! City presents plans for "Portland Landing"
In late May the City unveiled plans for a new waterfront park. The City has been working with Stantec Engineering to create a plan to redevelop the Amethyst Parking Lot between Ocean Gateway and the Portland Company on Thames Street. The open space would enhance public access to the waterfront and create a park space in the India Street neighborhood, a neighborhood seeing rapid growth and redevelopment. The slideshow from the May public forum is now available online. For updates on the proposed park, visit the city's website. Artist Sarah Sze has proposed three options for a proposed sculpture in Congress Square Park. The three options are now available online. 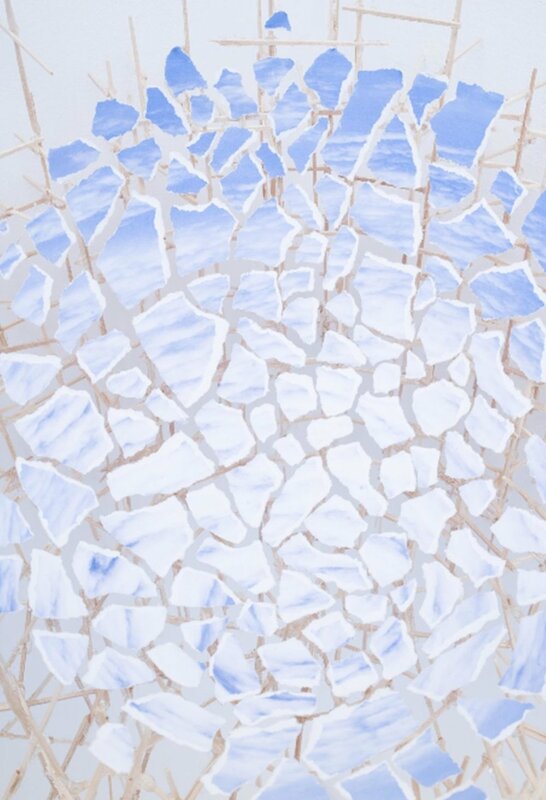 Each option consists of three pieces of diminishing size that would be installed within the park. The Portland Public Art Committee will meet on Wednesday, May 17 at 4:30PM to discuss the three options with the artist and to accept public comment. If you can't attend the meeting, public comment will be accepted online for one week following the meeting. For more information contact Caitlin Cameron. On May 10th at 5:30PM in the Merrill Auditorium Rehearsal Room, the City of Portland will hold a public forum on Fort Gorges. The City will explain what will be happening on the island this summer as the Army Corps of Engineers begins work on some safety improvements at the fort and will talk about the preservation planning process. The City is funding a preservation plan with help from Friends of Fort Gorges, the National Trust for Historic Preservation, and the Maine Historic Preservation Commission. The City of Portland will hold another public hearing on Thursday, April 13th at 6PM to take public comment on the draft comprehensive plan. It is expected that the plan, with some possible minor modifications, will be forwarded to the City Council and presented in a council workshop on Monday, April 24th at 5PM. Greater Portland Landmarks' staff and supporters have participated in public forums, workshops, and hearings as well as several meetings with city staff during the comprehensive plan's development. Our goal has been to insure that the plan reflects the incalculable contribution Portland's authentic sense of place makes to our city's economic, social, and cultural vitality. Learn more about Greater Portland Landmarks comments on the draft Comprehensive Plan here.